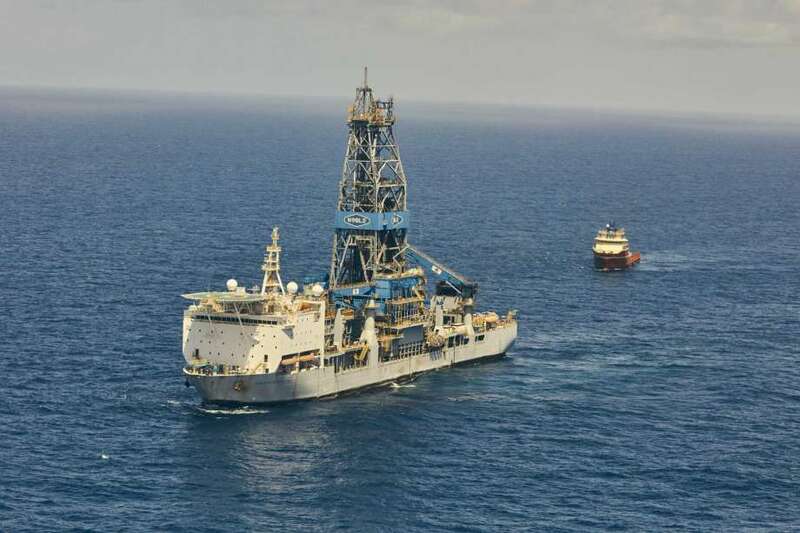 The Noble Bob Douglas drill ship, operated by Noble Corporation for Exxon Mobil, in the Guyana maritime territory, June 30, 2018. Exxon Mobil and Hess Corp. said Monday they’ve increased their reserve estimates offshore of Guyana by 25 percent after making a 10th discovery in the region. Exxon Mobil said the new Pluma-1 well discovery coupled with increased projections from other findings have hiked their reserve estimate from 4 billion barrels of oil equivalent up to 5 billion. This comes offshore of the South American country where Exxon Mobil is betting its future on perhaps more than anywhere else in the world outside of West Texas’ booming Permian Basin. “The discovery of a resource base of more than 5 billion oil-equivalent barrels in less than four years is a testament of our technical expertise and rigorous evaluation and pursuit of high-potential, high-risk opportunities in this frontier area,” said Neil Chapman, ExxonMobil senior vice president. Exxon Mobil said the Pluma-1 well was drilled to nearly 16,500 feet in ocean depths of 3,340 feet. The companies will next drill the Tilapia-1 prospect in the area. The first oil production of 120,000 barrels a day is expected to come online in early 2020 through the Liza Phase 1 development. Liza Phase 2 is expected to start up by mid-2022. Exxon Mobil and Hess are focusing on what’s known as the offshore Stabroek Block, which is 6.6 million acres.